If you've been searching for a truly high performance rear muffler for your M3 Sedan look no further. Dinan is the most advanced research company in the BMW aftermarket. Winning back-to-back-to-back Rolex Series Daytona Prototype racing championships in 2010, 2011 & 2012 along with the top two podium spots in 2011 and winning in 2013 the grueling 24 Hours of Daytona as the engine supplier to Chip Ganassi Racing. You can rest assured that you are purchasing the most leading edge technology on the market. Who else do you want to tune your BMW if not the company that beats the competition in power and durability in the most competitive road racing circuit in the US. What else would you expect from Dinan but the most technologically advanced exhaust on the market. The problem with most performance type exhaust systems is they compromise both flow and sound quality to try and achieve a balance between the two. Dinan’s Free Flow Exhaust employs leading edge technology to solve this problem with advanced features not found in most aftermarket high performance exhaust systems, including a Helmholtz chamber and single channel absorption increases flow while reducing unwanted noise and weight. The Helmholtz chamber is a resonance cavity that reduces the drone that most high performance exhausts have at light throttle cruise. 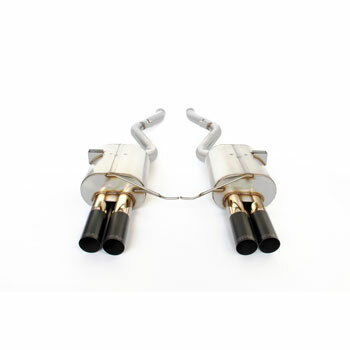 In addition Dinan has a straight through single pipe design to further reduce noise at light throttle cruise so that it is a civilized exhaust that you can live with everyday. The single channel dual exhaust is the most powerful and lightest weight stainless steel exhaust on the market (Read white paper on E90 M3 exhaust). The Dinan Free Flow Exhaust is a sporty sounding exhaust at wide open throttle when you want it but also quite and civilized when you are at light throttle cruise. This is consistent with Dinan’s core philosophy of "Performance Without Sacrifice". One of the reasons you purchased your BMW is because of its level of refinement. You won’t ruin the refined characteristics of your BMW when you use Dinan performance products. This level of development takes time and is the reason Dinan is usually not the first company on the market but you will find it is worth the wait. Durability is also a primary concern at Dinan. Built from 100% 20 gauge-304 stainless steel to resist corrosion and backed by a 4 year/50,000 mile warranty new car factory matching warranty, the most comprehensive warranty in the business and double that of our competitors warranty (see Dinan Warranty Statement). The design features quad 3.5" ceramic black tips for a tasteful high performance look. Improve performance by 6 horsepower and 5 lb-ft of torque. Contact your VAC Performance Advisor @ 215-462-4666 or by email to discuss your requirements. Does a louder exhaust make more power? Not necessarily. A freer flowing exhaust makes more power by removing friction in the exhaust system but how loud an exhaust is has to do with how well you absorb the sound as it travels through the exhaust. You can have a straight through design and maximum power with today’s technology. It is possible and common for a loud exhaust to actually make less power than a stock exhaust. The best exhaust is the one that is the freest flowing and has a noise level that you enjoy. What makes an exhaust "hummm" under light throttle? This sound is commonly called "drone". It is caused by resonance in the exhaust system and can quickly give you a headache. Drone is the toughest characteristic to remove from an exhaust system. The use of a "hemholtz" chamber to work as a noise canceling device is a great option along with the use of butterfly valves when needed. How are Dinan exhausts made? All Dinan exhausts are designed and hand built in California at the Dinan Headquarters. They are welded by hand using precise tools to ensue perfect fit. All are built from 20 gauge-304 stainless steel for strength and corrosion resistance. Does the kind of steel used matter? Yes. Your car's exhaust is subjected to the elements and other harsh conditions that occur under a car. The exhaust gets hit with gravel, salt, water, sand and whatever else is on the road. Using high quality stainless steel keeps corrosion at bay in this tough environment. This item is worth 3 point(s) towards your Dinan® Badge.